In this week’s Stat Attack we take a look at our opponents this weekend, Newcastle Jets, as well as a number of key and interesting statistics about Melbourne Heart FC’s season so far. 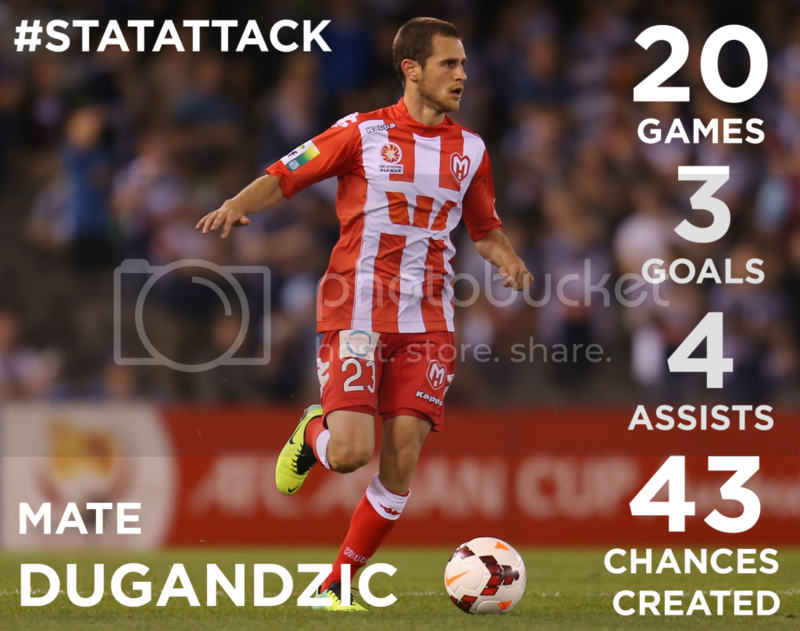 In this week-s stat attack we take a look at our opponents this weekend, Newcastle Jets, as well as a number of key and interesting statistics about Melbourne Heart-s season so far. Melbourne Heart made it five wins from five games on Saturday with a 4-0 win, our biggest ever home win, in the Melbourne Derby at AAMI Park. No side has won six in a row in the A-League this season, so a win for Melbourne Heart against the Jets would make them the first. Heart would also set a new season record for consecutive games unbeaten in the A-League if they can avoid defeat against the Jets. But John van-t Schip-s men have only scored one goal in their last three visits to the Hunter Valley, and have never even picked up a point at the Jets- home ground. Despite that, Heart are in the equal best form in the club-s history with the 2011-12 side also picking up five consecutive wins over the course of December of that season. Here are a collection of stats in relation to our clash against the Jets and from our season so far. 20 - Melbourne Heart have won the most points in the A-League in 2014 so far. 9 - Newcastle Jets have failed to score in nine A-League games this season; more often than any other side. 10 - Newcastle Jets have the worst points tally at home in the A-League this season. 5 - Melbourne Heart have failed to pick up a point against the Jets at Hunter Stadium in all their appearances at the ground. 46% - Adam Taggart has scored almost half of his sides goals in the A-League this season, which included a hat-trick against Heart back in November. 10.6% - Newcastle Jets have the worst shot conversion in the league. 11 - Melbourne Heart have scored the most set piece goals in the league this season. Five set plays, three corners, two penalties and one direct free-kick. 4 - Melbourne Heart became the only side to score more than three goals in a Melbourne Derby on Saturday night. 443 - Melbourne Heart have sent in 443 crosses so far this season with an accuracy of 22.% percent, which is the league's third best. 8 - Melbourne Heart have scored the most long-range goals so far this season. 4% - Of goals scored by Heart between the 16th and 30th minute mark this season. 5 - Melbourne Heart have scored the equal most headers in the league in 2013-14. 0 - Melbourne Heart haven-t lost this season after scoring the first goal. 3 - Mate Dugandzic has assisted a goal in each of his last three appearances. 10 - David Williams has now become the highest goalscorer for Melbourne Heart in a single season.